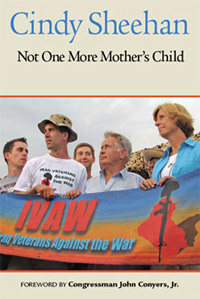 Cindy Sheehan lost her son Army Specialist Casey Austin Sheehan, in an ambush in Sadr City, Baghdad, on April 4, 2004. As information became available revealing that the war in Iraq was based on lies, she began speaking out against the war and demanding the troops come home. On August 6, 2005, she went to Crawford, Texas, to ask President Bush what is the noble cause for the war that he keeps citing in his speeches, and her efforts attracted international attention. During the rest of August, up to ten thousand people joined her at what came to be called Camp Casey, celebrating peace in an atmosphere of nonviolence and demanding that the president meet with Cindy and be held accountable for his policies. Bush did not meet with Cindy, but her efforts lifted the taboo against questioning this administration and sparked a nationwide debate on the war in Iraq. 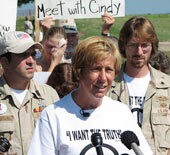 Cindy Sheehan is cofounder of Gold Star Families for Peace. Last year, Cindy declared that if Speaker of the House Nancy Pelosi did not make the effort to end the war in Iraq and put impeachment of President Bush back on the table, that Cindy would run for Congress in Pelosi's district as in independent. In August 2007, she declared she would be running and in August 2008, Cindy qualified to be on the November ballot running as an independent. Visit Cindy for Congress '08.